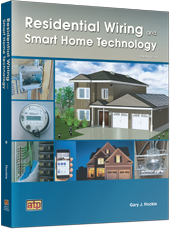 Residential Wiring and Smart Home Technology focuses on the principles, installation, and operation of wired and wireless residential electrical and electronic systems. This edition provides expanded material on utility power generation and distribution, electrical safety, and NEC® guidelines. New topics include smart home infrastructure, security and fire alarm systems, and energy management applications supported by the smart grid. A lifestyle applications chapter covers improvements to convenience and comfort provided by smart home technology.